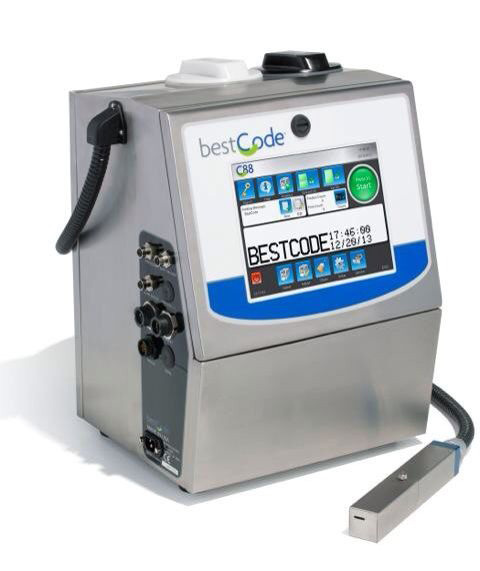 Bestcode marking and coding systems print batch, expiry date and other code information on industrial and consumer products to guarantee the product tracking. C80 systems are reliable and print with high speed on a wide range of surfaces like plastic, glass, metal, paper and others. C82 printer, designed for basic applications, to print 1 or 2 lines of text, in 1 or 2 daily turns, 5 days per week, 1000-2000 hours annual working, in medium-speed production lines. C86 printer, designed for high speed applications, to print 1, 2 or 3 lines of text, in 1 or 2 daily turns, 5 days per week, 2000-4000 hours annual working, in high-speed production lines. C88 printer, designed for high speed / cadence applications, to print 1, 2, 3 or 4 lines of text, in 2 or 3 daily turns, 5-7 days per week, 6000-8000 hours annual working, in high speed / cadence production lines.